Place the two charm squares right sides together on of the batting square. Centering so there is a little batting all the way around the charm squares. Start sewing 1″ from the top right hand corner. Continue to sew all the way around to the top left hand corner. Sew in 1″. this will leave an opening at the top. sides, by carefully cutting it close to the stitch without cutting into it. Clip all 4 corners to reduce bulk. Turn inside out between the two charm squares. Use a chop stick to make the corners nice and crisp. Press the opening 1/4″ into the seam allowance. On just 2 sides start quilting with a stitch 1/8″ from the edge and then move in 1/2″ at a time. Make 7 lines. Fold the ribbon in half and place the fold 1/2″ from the top right hand side on what will be the body of your scissor case. Fold in half with the body to the inside to form a triangle. Sew 1/8″ seam down the edge with the ribbon. at the end point sew back and forth 4 or 5 times about 1/2″ from the point. cut off the tip 1/8″ away from the seam. turn inside out and with your chop stick force the point in place. Insert the embroidery scissors, bring the tails of the ribbon through the scissors and tie under the button to keep the scissors from falling out. They go fast so make them in lots of color combos. 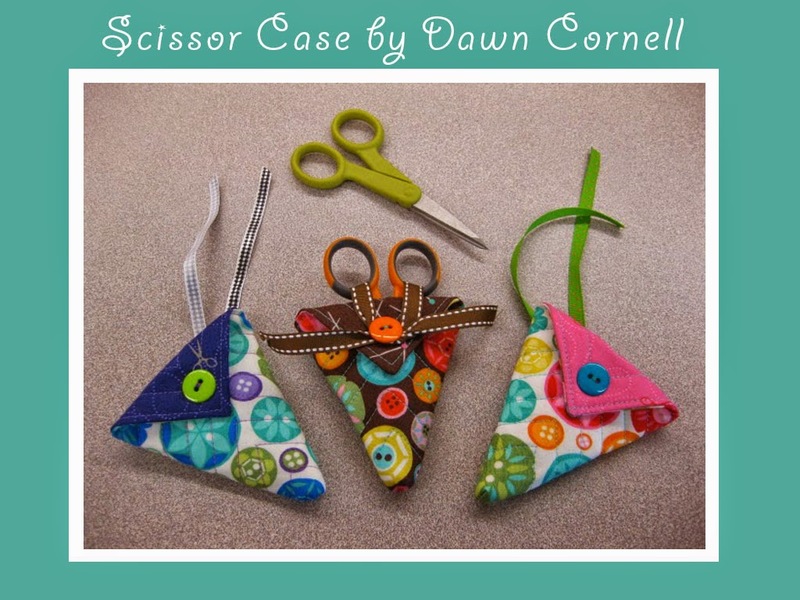 Makes a great gift for your sewing friends. This entry was posted in Accessories, Charm Pack, Easy.